In 2013, traditional Japanese cuisine, or Washoku, was registered as an intangible cultural heritage by UNESCO. 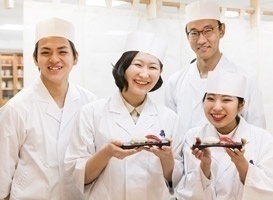 In the MICHELIN Guide, with its world-famous restaurant rankings, Tokyo was named the gourmet capital of the world and Japanese food is attracting worldwide attention. 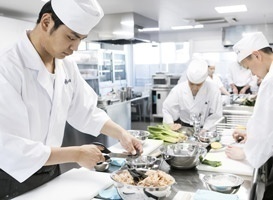 Because Japanese restaurants are expanding into overseas markets, chefs skilled in authentic Washoku and Sushi are currently in demand. 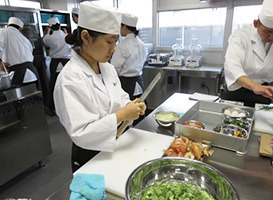 Cooking techniques, which start from careful preparation to making the most of the characteristics of the ingredients, beautifully displaying the culinary blessings from nature and from the four seasons, and meticulous service; chefs with such authentic Omotenashi (Japanese hospitality) skills, are in need in and outside of Japan. Copyright ©東京すし和食調理専門学校 All Rights Reserved.